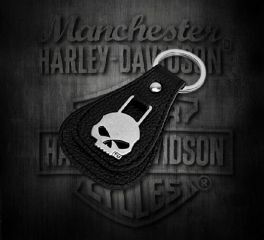 Start your engine like you mean it with Harley-Davidson® key chains and fobs. 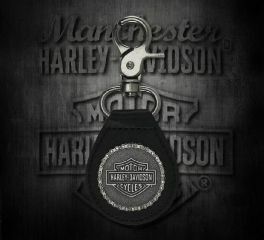 From large key rings to small leather fobs, Harley-Davidson® accessories are your keys to freedom. Harley-Davidson® Bar & Shield® Orange Logo Enamel Key Chain features the famous orange Bar & Shield logo. Made of durable enamel material. Very versatile, can be used as a key ring with the split key ring attachment or used as a zipper pull using the attached zipper hook. Great quality key chain. Size: 4" x 1.75"
Harley-Davidson’s® Willie G Skull Skeleton Key Bottle Opener Key Chain is uniquely different. It is multi-functional. Yes, it has a split ring for keys. It also has its own antique version of a key, complete with a head, shaft, shoulder, and bit. The bit, however, is actually a bottle opener. The head is shaped in the form of the famous Willie G Skull, and the shaft has those immortal words, Harley-Davidson® Motorcycles, engraved on it. The key chain is about 3-inches long and is made of die cast stainless steel for a lifetime of use. You can literally carry your own church key with you with this key chain. 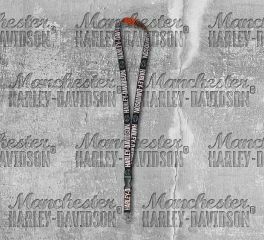 Harley-Davidson® Repeated H-D® Double Sided Script Lanyard. Lanyards are most popularly worn around the neck to carry such items as keys or an identification badge. They can also be used for whistles, even USB flash drives. You see them everywhere nowadays. Employees wear them at airports, at municipal buildings, at large businesses, in factories – they’re everywhere. Why not show your true colors with a lanyard that has Harley-Davidson® repeated over and over, grey on black, with alternating silhouette Bar & Shield® logos. Be true to yourself and go Harley®. 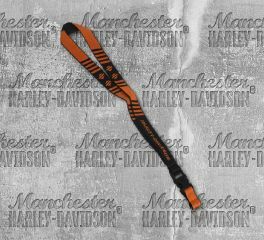 Harley-Davidson® H-D Break Lanyard, LY25766. Made from soft polyester, that will not irritate your neck. 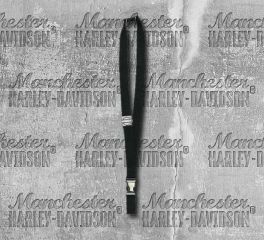 Woven Harley-Davidson® script and Bar & Shield® logos double-sided design. Harley-Davidson® Men's B&S® Medallion Teardrop Leather Key Fob features a split nickel ring and Bar&Shield® logo. Accessorize your keys and never lose track of them. Looking for present to your special someone? 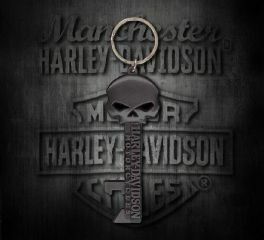 This Harley-Davidson® Stainless Key Fob is a perfect choice. The Willie G Skull and Ring is made from stainless, and the strap is made from leather. Its dimension is 21 mm in length, and 21 mm width. 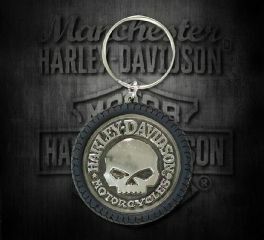 Harley-Davidson® Willie G Skull Medallion Key Fob is made from Genuine Leather, and also features a nickel ring. Harley-Davidson® Men's Snap Hook Brown Leather Key Fob is made from distressed cowhide leather, snap hook with split ring inside fob, snap closure, and debossed graphics. 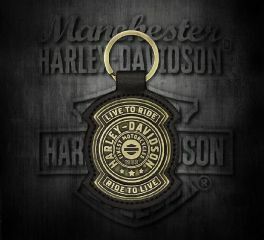 Its dimension is 4"H x 2"W.
Antiqued Harley-Davidson® Die Cast Live To Ride Shield on black leather Key Fob is the perfect gift for your dad, grand-dad or for yourself. This Antiqued 3D Die cast bronze plated shield on black leather fob has dimensions of 1-7/8" W x 3-1/2" H. Grab yours now. 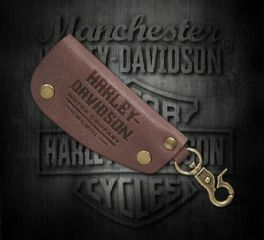 Harley-Davidson® Brown Leather Brass Clasp and Button Keychain is a perfect gift for your dad, grand-dad or for yourself. This antiqued keychain is bronze plated and placed on brown leather. Grab yours now.